Thank you for deciding to contribute to Dolphin Research Center. Only with your help can we continue in our mission of teaching, learning, and caring for Marine Mammals and the Environment we all share. YOU CAN HELP MAKE OUR FIRST FIELD RESEARCH PROJECT POSSIBLE! PLEASE HELP US KEEP "RESEARCH" AS OUR MIDDLE NAME! Please help us keep “Research” as our middle name! Are Keys’ dolphins dying or thriving? Is the dolphin morbillivirus that has impacted so many on the increase or decrease? 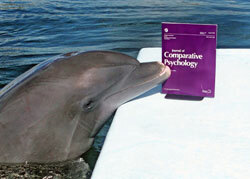 Have dolphins been affected by environmental issues or through association with humans? How will we determine the impact and subsequent solutions if we’re hit by an environmental catastrophe such as oil spill? How many dolphins are in our waters? Are there both resident and migratory dolphins here? What areas are important to them, when and why? How are they feeding, playing and interacting? DRC is perfectly suited to able to do this vital research. 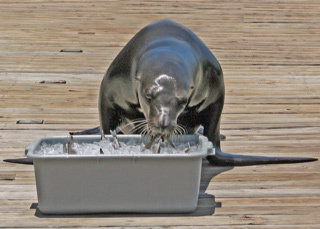 For over a quarter of century it has been our mission to learn about marine mammals, teach others what we’ve learned, and, in so doing, help protect the future of these wonderful animals and the marine environment we all share. We have the skills and experience to undertake this task and track record that includes a vast amount of important research publications. We also have one very, very important resource that makes us perfectly suited to do a field research study; a strong and support member and donor base that understands and supports the importance of our mission. Thanks to you, our research has been published and used by scientists all over the world and we’ve been able to pass our knowledge on to hundreds of thousands of guests and online visitors. Please help us continue this success by contributing to this essential research project! Dolphin Research Center has a long tradition of reaching out to children and adults with special needs. They have always held a warm place in our hearts. This is why we created the Pathways and Dolfriend programs. Your contribution will go a long way to help us continue to provide these programs. 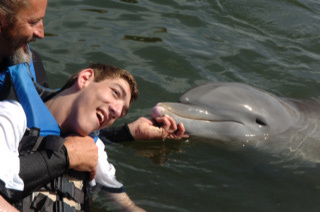 The Pathway and Dolfriend programs are designed to reach out to those with special needs and provide them with an entrance into the dolphins’ world. Educational and recreational activities are introduced to help increase motivation and enhance the personalized experience. Unfortunately these programs run at a deficit with an annual loss of over $80,000! Help us support our special needs programs.